Order Medela Quick Clean Wipes Online Here! 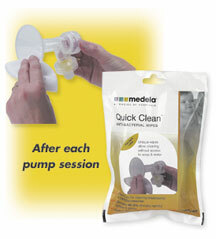 Medela Quick Clean Anti-Bacterial Wipes � New! No need for soap and water when you are needing to clean your breastpump between uses. 20 pre-moistened wipes are small enough to carry anywhere. Cut them in half to get 40 uses! One half of a wipe is saturated enough to clean both pump flanges, membranes and valves. Ideal for in the car, at work, travel and more. Just one wipe, (or 1/2) thoroughly disinfects. Removes most harmful bacteria and germs without leaving a residue. Multi-purpose....works great on tables, high chairs, cribs, countertops, changing tables, toys, and other hard non-porous surfaces. Directions: Wipe surface with towelette. Intended for use after pumping. If used immediately before pumping, rinse with water after wiping or allow ten minutes to air dry. Unscented, alcohol and bleach free! The wipes shipped from MFTH are individually packaged to prevent the rest of the pack from drying out when not in use. They will not come as packaged above in the photo. They are small enough to carry in your billfold or breastpump tote. For the price below, you will receive 20 individually pre-moistened anti-bacterial wipes. Need to add Micro-Steam Bags? Questions? Contact Mothering From The Heart..